Gates were supposed to open by 6PM at the Mall of Asia arena on January 19, 2016. I was there around early 6PM yet the file was already very long with kids chanting about opening the gates. It was actually around 7PM when the gates were finally opened. I looked for tickets two days after the ticket sale was up at the SM Tickets website. Just two days and there were no more good seats left, or at least the ones I wanted. I made a mistake choosing a seat. I haven't been to the Arena so I don't know how it looks like and how the seats were arranged. Lesson learned. I know what seats to pick next time. I wasn't hungry but I grabbed a hotdog and drink while waiting for the set to start. I guess even past 7PM, I was still early. The show supposedly starts at 8PM. At 8PM, the place is packed. There were no seats taken at the upper box though but there were several company suites on the next level below it. The concert started at around 8:16, if my watch was correct. While the producer actually provided a rule to avoid any recording of any kind (sorry, I wasn't following the producer's Facebook page so I didn't know), countless attendees have their phones up all throughout the concert and these same videos are now all over social media sites including Twitter, Instagram, and YouTube. Some innocent kids were propagating a message saying that the band will no longer come back due to this violation yet you'll find numerous videos of the concert posted all over social media sites. The same kids were posting comments as if it's law. Sadly, if this is indeed a basis for any band to avoid a country, it's too shallow. The Beatles landed in the Philippines (July 1966) and never came back because they were scared of the mob who threatened them to kill them all the way to the airport (they almost wasn't even allowed to leave if they didn't escape). Rumors say it was because they declined an offer for a dining feast with Imelda because they were exhausted. Now, that is far more acceptable. Anyway, there was somewhat a confirmation of a possible tour of One OK Rock again with a Philippine leg included. But please, no more of the no recording rules. We understand that the producers may release a DVD of the concert tour like they did before, but this is 2016 when video uploads all over social media is but common. This is also not the movie houses and we are not going to mass produce pirated disks using fan cams of mobile phones with poor quality. The phones I used to record are HD but they still aren't good enough. Another point: in YouTube, producers can place ads for videos with the band's copyrighted content (see image below for example). 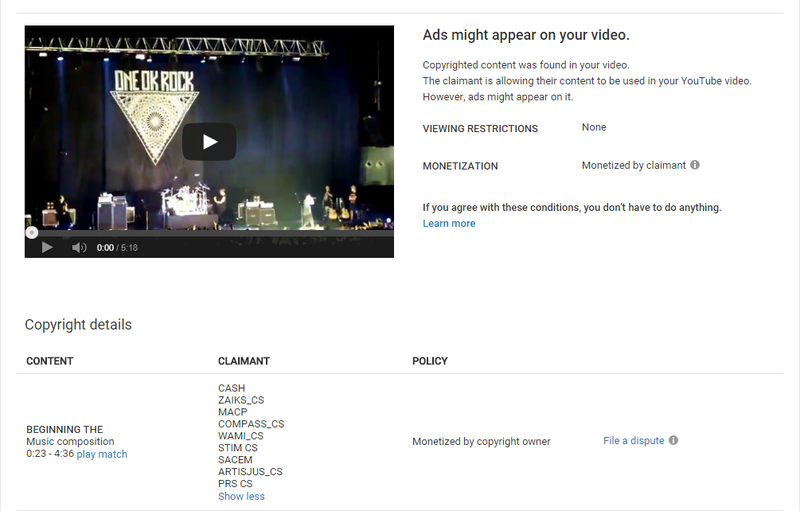 Almost all the concert clips I've posted have copyright tags. Hence, even the ads earned from the videos are not mine. I have no ads in those videos and they were just posted for the benefit of those who didn't watch it. I made a playlist on YouTube and tried to recreate the set list. Some videos were cut short due to phone memory or battery issues. Thank you very much One OK Rock! You should contact every single attendee who posted their videos too.